2. School of Public Health, Xinxiang Medical University, Xinxiang, Henan 453003, China. 4. Texas Lung Injury Institute, University of Texas Health Science Center at Tyler, Tyler, Texas 75708, USA. Regeneration of the epithelium of mammalian lungs is essential for restoring normal function following injury, and various cells and mechanisms contribute to this regeneration and repair. Club cells, bronchioalveolar stem cells (BASCs), and alveolar type II epithelial cells (ATII) are dominant stem/progenitor cells for maintaining epithelial turnover and repair. Epithelial Na+ channels (ENaC), a critical pathway for transapical salt and fluid transport, are expressed in lung epithelial progenitors, including club and ATII cells. Since ENaC activity and expression are development- and differentiation-dependent, apically located ENaC activity has therefore been used as a functional biomarker of lung injury repair. ENaC activity may be involved in the migration and differentiation of local and circulating stem/progenitor cells with diverse functions, eventually benefiting stem cells spreading to re-epithelialize injured lungs. This review summarizes the potential roles of ENaC expressed in native progenitor and stem cells in the development and regeneration of the respiratory epithelium. Keywords: amiloride-inhibitable sodium channels, mesenchymal stem cells, proliferation, differentiation, pluripotent stem cells. Epithelial Na+ channels (ENaC) are of importance in Na+-absorptive epithelium, such as in the airway, the alveolus, the kidney, and the distal colon, and control the overall rate of transapical Na+ transport. ENaC proteins are mainly located in the apical membrane of polarized epithelial cells and have four homologous subunits (i.e., the α, β, γ and δ subunits) [1, 2]. The α or δ ENaC subunit, which is essential for acting as a sodium channel, forms the channel pore, whereas the β and γ ENaC subunits are critical for amplifying the efficiency of Na+ influx. In mouse, the gene scnn1d, which encodes δ ENaC, is assumed to be a pseudogene . In the lungs, alveolar lining fluid is critical for efficient gas exchange, and ENaC complexes play a crucial role in alveolar fluid clearance to maintain homeostasis of the luminal liquid. Pulmonary diseases, including acute lung injury, cystic fibrosis, chronic obstructive pulmonary disease, and asthma result from or are associated with the dysfunction or dysregulation of ENaC, and the regeneration of epithelial cells and the restoration of ion transport are two key steps in recovery from those diseases. In this article, we review the progress of research on ENaC-mediated lung injury repair, in particular the role of ENaC proteins in re-epithelialization by endogenous and allogeneic stem/progenitor cells. The mammalian pulmonary epithelium, a multilevel, branched network, can be functionally divided into the proximal conducting airways and the distal gas-exchange domain. The development of the airways and the lung is the result of specification and separation of a group of progenitor cells from the ventral region of the anterior foregut. In humans, the development of the airways and alveoli from fetal to adult stage was investigated by Gaillard et al . Before the 10th week of gestation, the airway epithelium consists of undifferentiated columnar cells, and then ciliated cells, secretory cells, club cells, alveolar type I (ATI) and type II (ATII) cells differentiate from these progenitor cells at different stages of gestation (Figure 1). A recent study indicated that both ATI and ATII cells are derived from a lineage of bipotential progenitors during embryonic development and that ATII cells undergo a switch that functions both to self-renew and to generate ATI cells . Lineage hierarchies constructed using single-cell RNA-seq unveiled the differentiation steps of these bipotential progenitors . In adults, the lung not only undergoes a slow turnover, but also repairs itself rapidly, indicating the existence of a subpopulation of stem cells or progenitors with preserved differentiation potential. The stem/progenitor cells able to repair injured lungs include club cells, bronchioalveolar stem cells (BASCs), and ATII cells. In addition, submucosal gland duct stem cells and neuroendocrine cells have the potential to differentiate into club, basal, serous, or ciliated cells, as well as into distal airway epithelium. Club cells, BASCs, and ATII cells are dominant in the pulmonary epithelium and have been generally well studied. Club cells are able to self-renew, differentiate into ciliated epithelial cells, and contribute to the replenishment of both ATI and ATII cells in lungs injured by bleomycin or infection with H1N1 influenza [6-8]. BASCs are located in bronchioalveolar duct junctions, and following catastrophic alveolar epithelial injury, can replenish cell lineages in the alveolus . In addition to club cells, distal airway stem cells (DASCs) and basal cells contribute to replenishing other pulmonary epithelial cells. ATII cells are involved in the regeneration of alveoli, maintaining a slow self-renewal in normal lungs and then differentiating into ATI cells during lung injury repair. Additionally, a subpopulation of alveolar epithelial cells expressing integrin α6/β4 and DASCs has the potential to differentiate into ATII and club cells [9, 10]. Recently, a new type of basally located DASCs that express Trp63 and keratin 5 was also reported to be crucial for epithelium regeneration in airways and alveoli [11-13]. The expression of ENaC in the human respiratory system was confirmed in a development-dependent manner . At the early stage of embryonic development (≤ 16 wk of gestation), the β- and γ-ENaC subunits were not detected in human airways . Near birth, increased ENaC activity was present on the apical surface of lung epithelial cells, and active Na+ transport was promoted . In adult airways, the expression pattern of ENaC was similar to that in the canalicular period (17-24 wk) (Figure 1). Transcripts of α-ENaC were expressed in club cells throughout fetal lung development , and all four subunits (α, β, γ and δ) were detected in adult club cells [1, 16]. ENaC mRNA was distributed in ATII cells after 28 wk of gestation , and ENaC subunits were also expressed in ATII cells (Figure 1) [2, 18, 19]. The expression of ENaC in respiratory epithelial cells at different stages of human fetal development and after birth. The distribution of ENaC is shown by the green line. Bronchioalveolar stem cell + ? Distal airway stem cell + ? +, have differentiation potential or express ENaC; -, do not have differentiation potential or do not express ENaC; ?, status is unclear. In postnatal pulmonary epithelium, Na+ ions flow into epithelial cells via apically located ENaC proteins and are actively pumped out of the cells by Na+-K+-ATPase at the basolateral membrane. The subsequent osmotic gradients prompt transepithelial liquid re-absorption. ENaC has been functionally detected in both human club cells and ATII cells. Apical fluid volume regulated the activity and abundance of ENaC in H441 cells originally derived from human club cells. Dexamethasone, a corticosteroid, regulated ENaC activity in club- and ATII-like cell cultures, by promoting the expression of ENaC  subsequent to activating the SGK1, PI3K and cAMP/PKA signaling pathways . Treatment with dexamethasone and cAMP-elevating agents can lead to the differentiation of the aforementioned native stem cells to club cells or alveolar cells [22, 23]. SGK1 and PKA can phosphorylate the ubiquitin ligase Nedd4-2, which mediates the internalisation and degradation of ENaC by binding to the proline-rich domains of ENaC . Moreover, a number of signaling molecules, such as hydrogen sulfide, nitric oxide, UTP, and CPT-cGMP regulate ENaC activity in H441 cells [25-27], and respiratory syncytial virus can inhibit ENaC-mediated alveolar fluid clearance by upregulating the synthesis of UTP and nitric oxide . Bacterial impairment of ENaC activity is controlled by the phosphorylation of ERK. Phosphorylation of ERK1/2 results in a decrease in the expression and function of ENaC in ATII cells . Nedd4-2 facilitates the effects of PKC on ENaC activity in ATII  and club cells , and PKC may also play a role in ENaC-PIP2-MARCKS complexes, which regulate the open probability of ENaC and can be stabilized by binding with TNF , another factor that may also enhance ENaC activity in ATII cells [30, 31]. PKC, cAMP/PI3K, PKA and cGMP mediate the regulation of ENaC by LPS in ATII and club cells [32, 33], and PKC was shown to mediate Wnt signaling, which regulates the differentiation of mesenchymal stem cells (MSCs) to ATII cells and of ATII to ATI cells . Additionally, cGMP levels were inversely related with the expression of ATII markers when undifferentiated lung epithelial cells were treated with inhaled nitric oxide . Therefore, regulation of ENaC by ERK, PKC, cAMP, PKA, and TNF may play a role in the differentiation of endogenous progenitor/stem cells. In postnatal lungs, epithelial stem/progenitor cells are reserved for injury repair. Whenever injury occurs, the epithelial stem/progenitor cells go through essentially the same process, including migrating to the injured region to cover the denuded airway and alveolar sac, and proliferating vigorously to provide enough cells for epithelium repair, differentiation, and remodeling, and finally the normal airways and lungs are regenerated structurally and functionally. For example, in naphthalene-induced airway epithelial injury, BASCs exhibit highly proliferative activity in response to the injury of club cells . ENaC subunits are thought to be involved in injury repair and wound healing. Methylation of ENaC is an important event while aldosterone promotes the wound healing in BeWo cells and other epithelial cells. Mechanistically, migration of cultured epithelial and nonepithelial cells occurs in an ENaC-dependent manner [37, 38], and serum- and glucocorticoid-induced kinase 1 (SGK1) regulates cell proliferation through an ENaC-associated process. 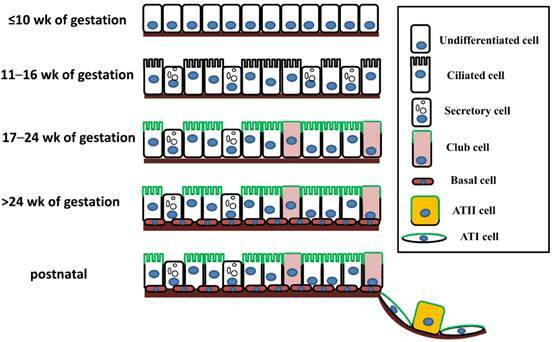 Cell migration generally undergoes several processes, including depolarization, membrane elongation, adhesion, contraction, and de-adhesion, that are regulated by interactions between cells, and between cells and the extracellular matrix. Chifflet et al. reported that actin reorganization and membrane depolarization depend on ENaC-regulated extracellular Na+ ions during wound healing of bovine corneal endothelial cells . ENaC proteins are the central part of a complex that links the cytoskeleton with the extracellular matrix , and the binding of the C-termini of α- and β-ENaC with filamins exerts an inhibitory effect on ENaC function . ENaC proteins are also a critical part of the mechanotransducer for myogenic contraction . Rooj et al. found that a deficiency in ENaC caused more D54-MG cells to arrest in G0/G1 phase, with fewer cells accumulating in the S and G2/M phases ; it was suggested that cell division is depressed when ASIC1 and ENaC are inhibited and that phosphorylation of ERK1/2 may be an underlying mechanism . This group also found that interactions between amiloride-sensitive cation channels (ASIC1 and ENaC) and integrin-β1, mediated by α-actinin, could in part regulate the proliferation and migration of glioma cells . In addition, ENaC is involved in the proliferation and migration of various cancer cells . The effects of ENaC on osteoblast differentiation have been studied by several groups who found that the expression of ENaC mRNA accompanied the osteoclastogenesis of rat osteoblasts. Stimulation of osteoblast differentiation by 8-pCPT-cGMP is also dependent on the expression of ENaC  and therefore, ENaC activity is apparently required for the differentiation of both osteoblasts and osteoclasts. In club and ATII cells, the aberrance of ENaC expression usually leads to Na+ absorption disorder, hydropic degeneration and necrosis of club cells, goblet cell metaplasia, failure of airway mucus clearance, susceptibility to spontaneous bacterial infection, airway inflammation, and even death caused by airway obstruction and asphyxiation . ENaC proteins are electrically detectable as functional biomarkers of differentiated epithelial cells. Because of the role of ENaC in the migration and proliferation of stem/progenitor cells, it can be speculated that normal ENaC function would be critical in the repair of injured lungs by MSCs [46, 47]. Goolaerts and colleagues reported that impaired ENaC activity under hypoxic and cytomixic conditions was restored by co-cultured MSCs and paracrine KGF . Moreover, impaired ENaC function of alveolar fluid clearance was recovered by human MSCs delivered intratracheally in a clinically related, human lung injury model . The improvement of ENaC function and the contribution of ENaC to re-epithelialization potentially explain the promising results of clinical trials that show a significant reduction in lung injury score in acute respiratory distress syndrome (ARDS) and other lung injury treated with stem cells [50-53]. Lung injury is associated with defective epithelium and dysfunctional ion transport, and stem cell therapy to repair injured tissue has broadened the prospects for treatment beyond supportive approaches. The functional consequences of normalizing injured epithelium are usually evaluated by detecting the expression and activity of ENaC. However, our understanding of the mechanisms by which ENaC regulates differentiation of lung stem/progenitor cells is incomplete, for example, whether ENaC contributes to the release of paracrines from allogeneic MSCs, and what are the roles of ENaC in the re-epithelialization mediated by these paracrines. Further mechanistic studies are required to address these essential issues. This work was supported partially by institutional funds (to YL, BJJ, and HLJ) and American Heart Association grants (HLJ and RZZ, 14GRNT20130034 and 16GRNT30780002). Corresponding author: Hong-Long Ji, james.jiedu.